The Old Operating Theatre Museum and Herb Garret is a museum of surgical history and one of the oldest surviving operating theatres. It is located in the garret of St Thomas's Church, Southwark, in London, on the original site of St Thomas' Hospital. There is little information about operating theatres at Old St Thomas from its foundation till the 18th century. The church that contains the Old Operating Theatre Museum was built at the end of the 17th century, when the hospital and church were largely rebuilt by Sir Robert Clayton, president of the hospital and a former Lord Mayor of the City of London. He employed Thomas Cartwright as architect. (Cartwright was master mason to Christopher Wren at St Mary-Le-Bow). The new church was fitted out with a large garret constructed in the 'aisled-barn' tradition. Very little information exists about the Garret except that it was fitted with wooden storage racks, and was described as "the herb garret" in 1821. Dried heads of opium plants were found in the rafters. It is likely that the garret was used by the hospital's resident apothecary to store and cure medicinal herbs. In 1822 part of the herb garret was converted into a purpose-built operating theatre. This strange situation resulted from the fact that the female surgical ward abutted the garret. Previously operations took place on the ward. Windows were also provided for the Garret at the same time, suggesting that its function changed from storage to a working environment. It may have been used as a recovery ward. In 1859, Florence Nightingale became involved with St Thomas's, setting up on this site her famous nursing school. It was on her advice that the Hospital agreed to move to a new site when the Charing Cross Railway Company offered to buy the hospital’s land. In 1862, the hospital began the move to its present site at Lambeth and the operating theatre was closed. The theatre lay undiscovered until 1957. The patients were mainly poor people who were expected to contribute to their care if they could afford it. Rich patients were treated and operated on at home rather than in hospital. The patients at the Old Operating Theatre were all women. Until 1847, surgeons had no recourse to anaesthetics and depended on swift technique (surgeons could perform an amputation in a minute or less), the mental preparation of the patient, and alcohol or opiates to dull the patient’s senses. Thereafter, ether or chloroform started to be used. The Operating Theatre had closed down before antiseptic surgery was invented. The majority of cases were for amputations or superficial complaints as, without antiseptic conditions, it was too dangerous to do internal operations. A description of the students packing the theatre to witness an operation has been left by a St Thomas surgeon, John Flint South. The first two rows ... were occupied by the other dressers, and behind a second partition stood the pupils, packed like herrings in a barrel, but not so quiet, as those behind them were continually pressing on those before and were continually struggling to relieve themselves of it, and had not infrequently to be got out exhausted. There was also a continual calling out of "Heads, Heads" to those about the table whose heads interfered with the sightseers. Patients put up with the audience to their distress because they received medical treatment from some of the best surgeons in the land, which otherwise they could not afford. Wealthy patients of the surgeons would have been operated on, by choice, at home, probably on the kitchen table. The risk of death at the hands of a surgeon was greatly increased by the lack of understanding of the causes of infection. Although cleanliness was a moral virtue, descriptions suggest that a surgeon was as likely to wash his hands after an operation as before. The old frock coats worn by surgeons during operations were, according to a contemporary, 'stiff and stinking with pus and blood'. Beneath the table was a sawdust box for collecting blood. The death rate was further heightened by the shock of the operation, and because operations took place as a last resort, patients tended to have few reserves of strength. The oldest surviving operating theatre in the UK (dating from 1822), used in the days before anaesthetics and antiseptic surgery. The herb garret used by the hospital’s apothecary to store and cure herbs used in healing. A collection of artefacts revealing the horrors of medicine before the age of science. Includes instruments for cupping, bleeding, trepanning, and childbirth. Displays on medieval monastic health care, the history of St Thomas’s, Guy's Hospital and Evelina Children's Hospital, Florence Nightingale and nursing, medical and herbal medicine. The museum is a member of the London Museums of Health & Medicine. The nearest London Underground station is London Bridge; it is also a National Rail station. The Herb Garret was so called by the Grand Committee of St Thomas' Hospital when, in 1821, they ordered that an operating theatre be built in the garret of the church to serve the patients of the hospital. Little is known of its function beyond its name and the discovery of poppy heads in the rafters. It was presumably used to store and dry herbs for the hospital's apothecary. At about the same time as the operating theatre was built, the garret was reroofed and dormer windows inserted. It has been conjectured that this may suggest the garret changed use, perhaps becoming a recovery ward. 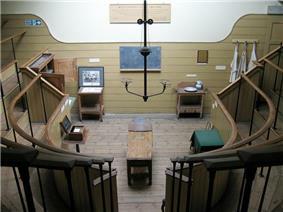 In 1962, after 100 years of disuse, the garret and operating theatre were opened to the public as the current museum. ^ "50th Anniversary of the Opening of the Old Operating Theatre Museum". The Old Operating Theatre Museum & Herb Garret. The Old Operating Theatre, Museum & Herb Garret. Retrieved 20 June 2015. ^ a b "How to Contact Us". The Old Operating Theatre, Museum & Herb Garret. The Old Operating Theatre, Museum & Herb Garret. Retrieved 20 June 2015. ^ "Old Operating Theatre Museum and Herb Garret Web Site". Retrieved 13 August 2014.